I visited many places around Patan district with my friend Dr. Sanjay Dave due to our similar interests. Dr. Sanjay Dave is an ornithologist at HNGU. 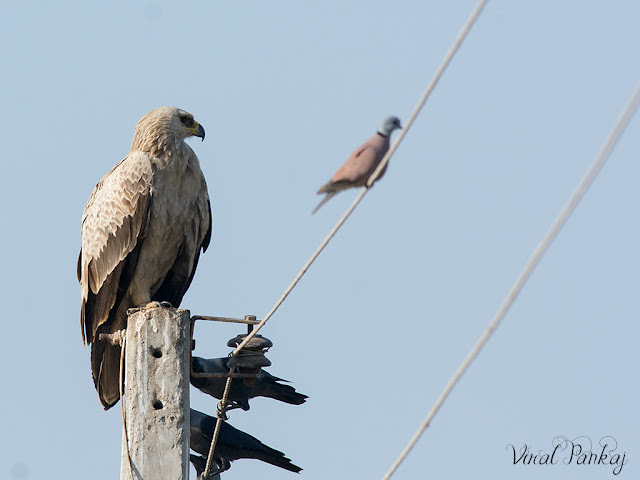 He always talks about the Vulture at the Vav Panjralpol. Therefore, in this winter we decided to visit Vav village. We started our journey around 7 am. This was my first experience in this region. We reached at Vav village around 10 am. We try to search for animal carcass disposal area. One of the security guard guides us there. 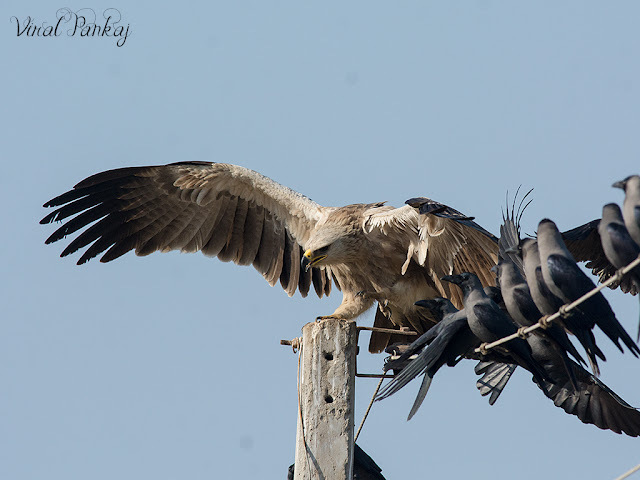 While we inquired about Vultures, I suddenly saw an eagle perched on tree nearby carrion. We were totally unaware of its present. 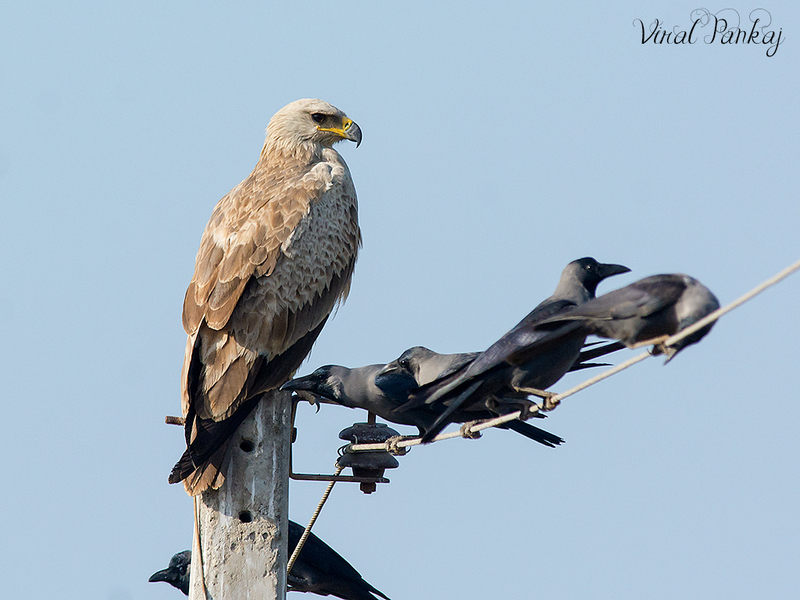 When I locate and trying to take photographs, it’s immediately fly away and perched on electricity pole. As per local people vultures didn’t visited this place from many years. Street dogs took that area. 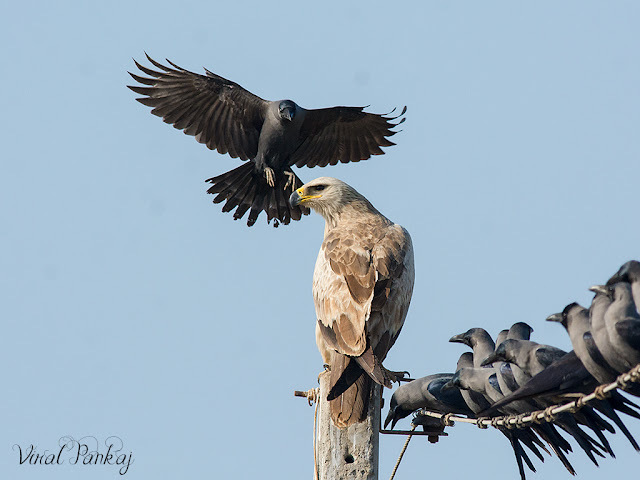 Then almost immediately we turned towards that eagle and recognize it as Tawny Eagle. 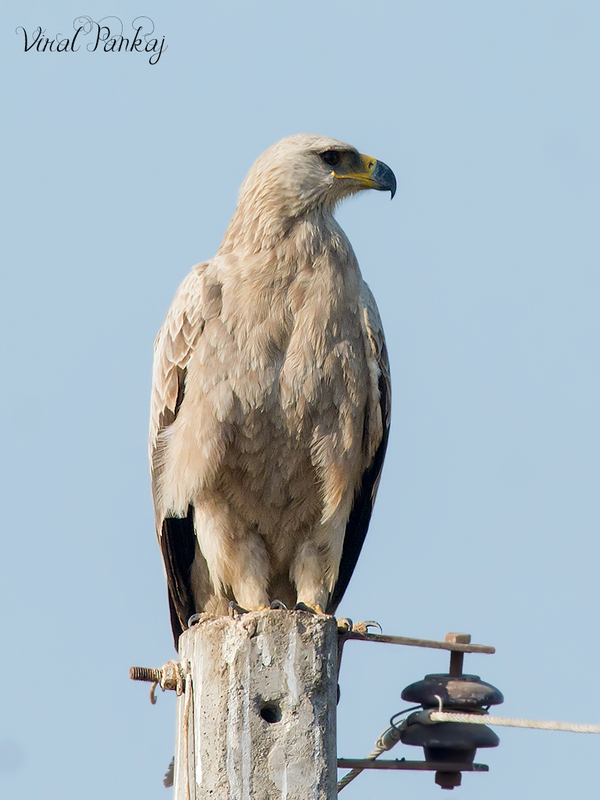 Common and widespread, the tawny eagle is a relatively large, handsome bird of prey, with heavily feathered legs. Word Tawny means for an orange-brown or yellowish-brown colour. This eagle’s plumage is generally tawny to rusty brown in colour, often with dark markings on the wings, especially the flight feathers. I got some nice shots. 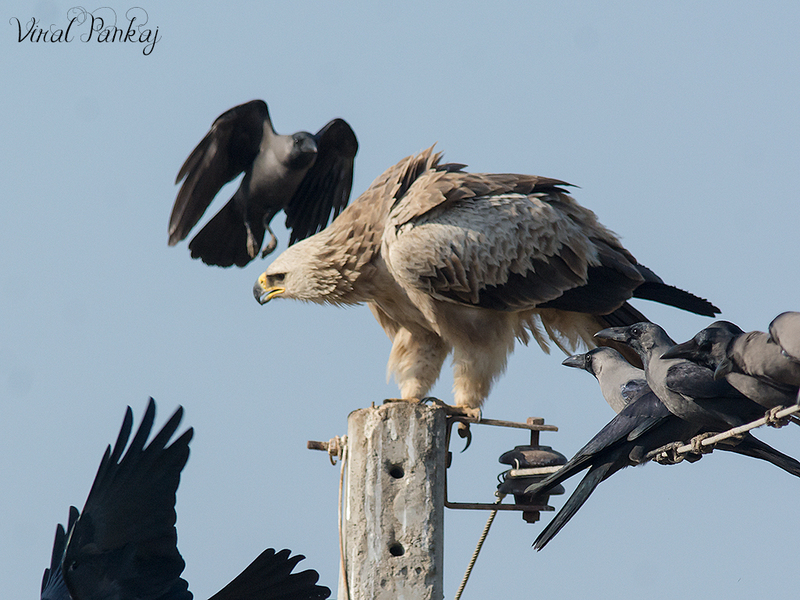 After some time we notice that suddenly House crows started to gather slowly one by one near perch of Tawny Eagle. 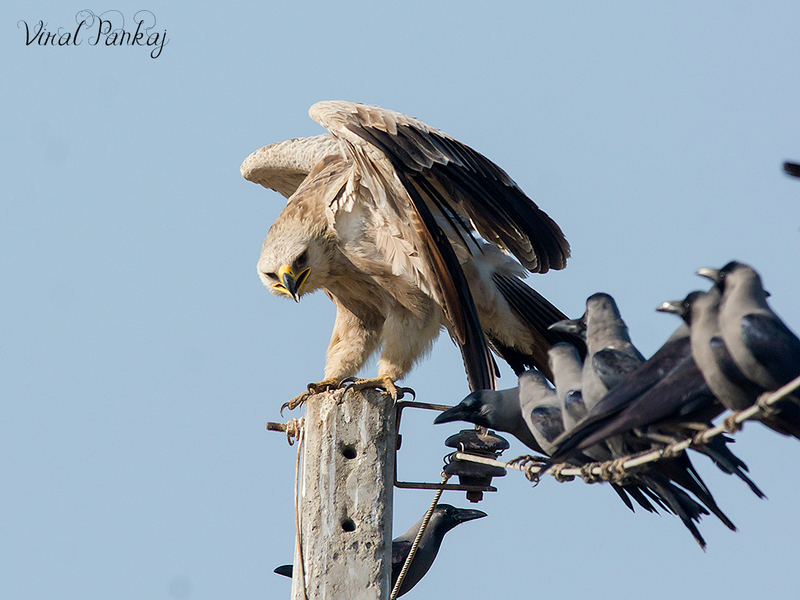 Once their number is enough, they started to mob Tawny Eagle. 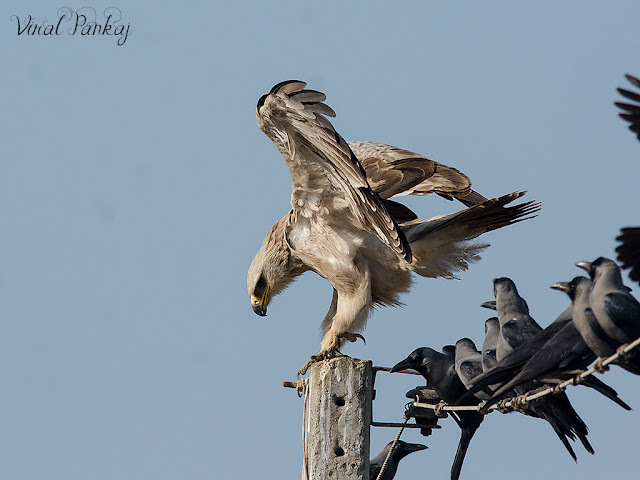 Tawny Eagle changed keep changed its position several times, as House Crows did not allow Tawny Eagle to set at one place. Annoyed Tawny Eagle give hostile reactions to their actions but can’t just get rid of House crows. 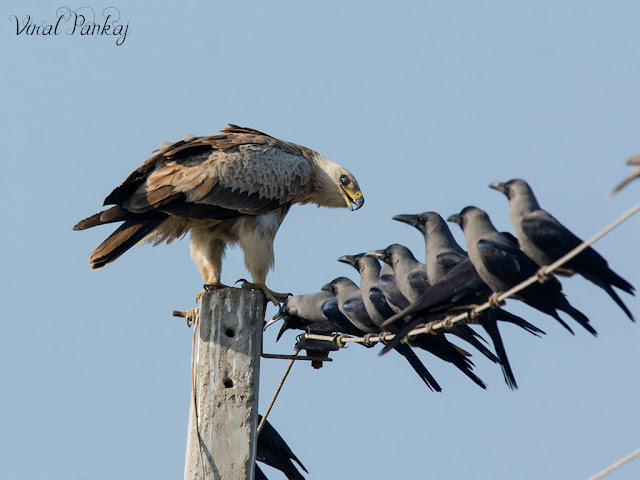 In the case of House crows its seems obvious that more number is always better…. !